59. For transmitting two speeds by gearing. The band is shown on the loose pulley—the left-hand one of the lower three. 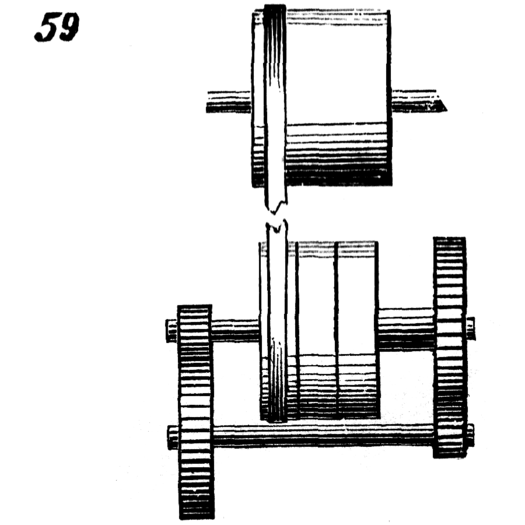 The middle pulley is fixed on the same shaft as the small pinion, and the pulley to the right on a hollow shaft, on the end of which is fixed the large spur-gear. When the band is on the middle pulley a slow motion is transmitted to the shaft below; but when it is on the right-hand pulley a quick speed is given, proportionate to the diameter of the gears.